The trail starts next to the map and informational kiosk next to the Trautwein Homestead. There is a large map showing the preserve boundaries, the trail and some of the history of the family that used to own the land. The parking here is limited. There might be about 20 spaces total, depending upon how well drivers line up their cars and trucks. Once the parking area is full people are asked to come back at another time. Some signs along the trail indicate that the portions of the trail covered in crushed granite are ADA compliant. I would hesitate to call this trail even partly ADA accessible. It looks like the crushed granite only goes a couple hundred feet to the turn where bikes and hikers and horseback riders are sent in opposite directions. Contrary to what you might think, there are not separate trails for bikes riders and other users. Instead, the trail forms a loop and the trail planners decided to route bikes in a clockwise direction and the hikers and horseback riders in a counter clockwise direction. Though the trail does not feature any dramatic views from the top of a mountain it does have a few nice ones such as this. Note also the information kiosk sign along the trail. This scheme actually seems to work out very well here. On many trails where hikers and riders share the trail I've often felt like I have to have my head on a swivel to determine whether or not the noise I heard behind me was a bicycle about to overtake me at a relatively high speed. With the higher speed users going in the opposite direction from the slower speed users that's never an issue. Both eyes and ears can work on one direction to avoid any collisions. 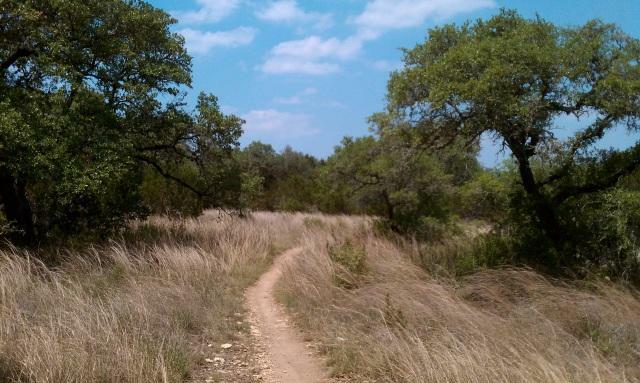 The terrain undulates through a restored savanna that is maintained by the Austin Wildland Conservation Division as a Water Quality Protection Land program. As such, facilities are minimal here and the emphasis is on protecting the land's ability to filter rain water into the underlying aquifer. To accomplish this Ashe Juniper (a.k.a. Cedar) is cut back and native grasses are encouraged to grow in pocket prairies that more closely resembles what the area looked like before man interfered with the normal processes. 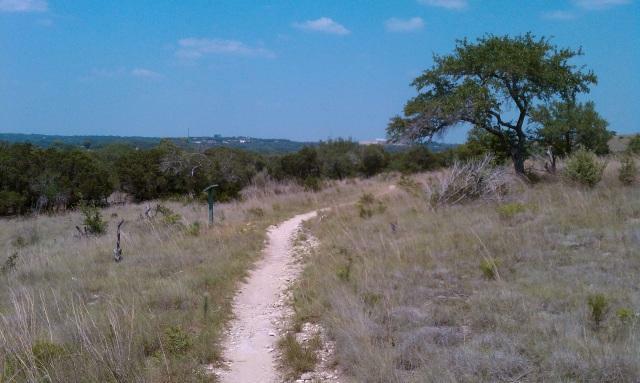 For trail users this means that Slaughter Creek Preserve's trail provides lots of Sun! There are patches of Oak and some Juniper still standing that can provide a bit of respite to enjoy a snack or a drink of water. However, one is well advised to bring your sunscreen. There are a couple of hilltops in the preserve but the trails venture around them making the going fairly easy for both bike riders and hikers. After mile marker 1 and for the next couple of miles the trail does pass close to the edge of preserve and near some of the homes of the Circle C subdivision. Though the houses are often shielded by trees and brush the sounds are not so easily covered up. On my visit the sounds of a child's birthday party and a roving ice cream truck were my frequent companions for part of the hike. The waypoint marks a cutoff near the 2.5 mile mark where one can elect to head back to the trailhead and cut the hike short. That decision will net a length of a bit over 3 or 3.5 miles instead of the full five. Along the trail I ran into an assortment of animals that one normally expects to see and hear, including Cardinals, White Wing Doves, Mourning Doves and lizards scurrying off into the brush. I also spotted a White-Tailed Deer that huffed a warning to any others in the area as he hopped into the brush. I really like this trail. It's not especially spectacular, and there are scarcely any water features, but it feels pleasantly intimate--there are lots of pocket-sized little ecosystems dotted throughout--patches of woodlands, snippets of prairies, bits of hillsides--lots of nice variety. I've hiked it twice, in late March and again in mid-April, and there are carpets of pretty little wildflowers--vivid magenta phlox, bright indigo blue-eyed grass, pinky-purple alliums, celestials, a low-growing yellow daisy of some kind, Heller's[?] plantain (Plantago), and that tiny, white umbelliferous thing that smells sweet*. So far, I've only gone in the evenings (after work) in the spring--I suspect I won't like it so much in July or in the middle of the day. But for my purposes, it's a very nice hike. Note that the gate shuts itself at dusk, and there's a very menacing sign saying that anyone on the property after that time is guilty of criminal trespass. So watch the time and don't take on more than you can hike in the amount of daylight available to you!